The shallow, shifting hazardous bar at the mouth of the Bellinger River was a continuing problem in the early days, as even the smallest coastal trading ships were bar-bound or unable to enter the estuary for weeks on end if conditions were unfavourable. In 1868, after considerable lobbying from farmers and timber merchants, the Pilot Station was established by the Government’s Marine Board, to help provide safe passage in and out of port. 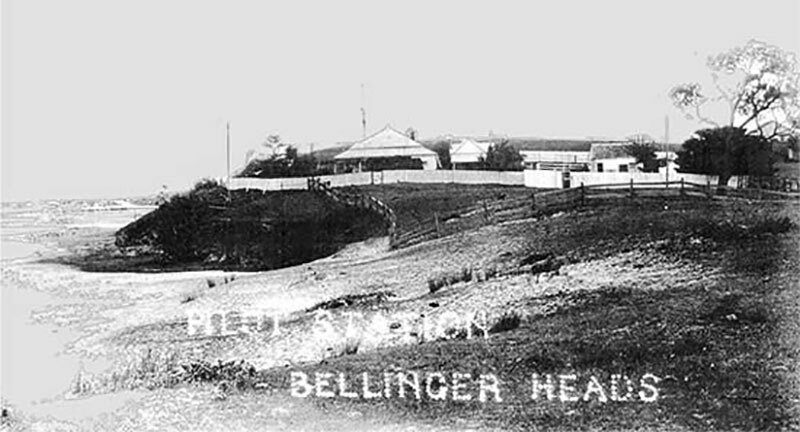 Pilot Stewart and his four boatmen and their families were the first settlers at Bellinger Heads (later renamed Urunga) and arrived with nothing more than two rowing boats, canvas tents and basic supplies. Eventually the Pilot Station consisted of the Pilot House and Signal Mast high on the hill with a clear view out to sea, and down near the water the four boatmen’s cottages, a boatshed and slip, two rocket sheds and a light shed. A footbridge was built to give access to the navigation lights at the Heads, breakwalls were built and dredges worked to deepen the channels and by 1900 the pilot’s tug was helping 200 ships a year to negotiate the tricky bar entrance. By the 1920s rail and road transport links were established to the north coast and these safer, more reliable means of transport caused the coastal shipping trade to decline. The Urunga Pilot Station closed in 1936.